I'm a sucker for sales, it is known. 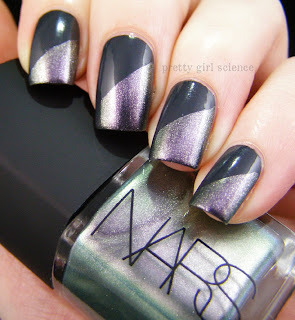 G. at Nouveau Cheap posted about a $5 Nars polish at Sephora...and I couldn't help myself. I had never tried a Nars polish, and I certainly wasn't going to buy a $20+ polish without trying it first. I wasn't overjoyed that it was a sheer polish. You know me, I'm not one for layering. But I do love the shiftiness and the tiny bits of glitter. I think this one might be more Amanda's speed than mine. The formula was quite nice, and the funky cubed lid didn't get in the way of application. I decided to layer it over a charcoal gray, and I am glad I did. While at work, I think eight separate people commented on it. Who knew a bit of tape could be so eye-catching? polish, so I left it alone.